We've been setting up Logic to recreate Live's Beat Repeat function, which creates rhythmic repetitions of an incoming signal — to awesome effect! 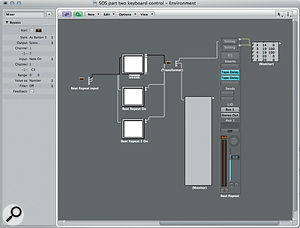 You'll need to start with the project I explained how to create in last month's Logic workshop. If you're an SOS subscriber, you can find the workshop article at /sos/jan13/articles/logic-notes-0113.htm. If you're not (or just prefer not to work through the steps), you can download the project from /sos/jan13/articles/logicmedia.htm. This month, we'll add keyboard control to the simple Beat Repeat effect. Keyboard-controlled effects allow the user to send different trigger signals much more efficiently than simply using a mouse. 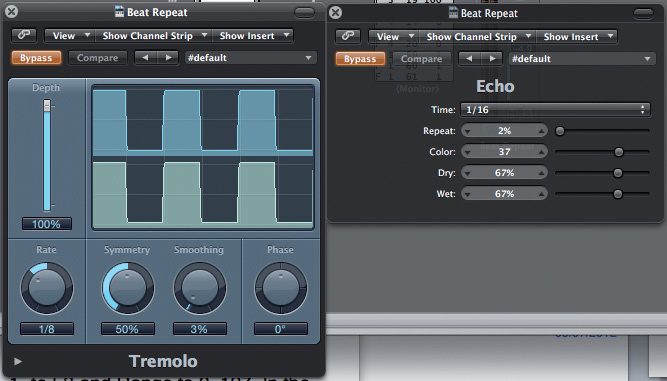 Go to the Environment, create a Transformer object, and label it 'Beat Repeat Input'. Cable an outlet of the Transformer object to the inlet of each of the three buttons created in last month's workshop. The Inspector settings for the Bypass button and the routing of the 'Beat Repeat Input' Transformer. 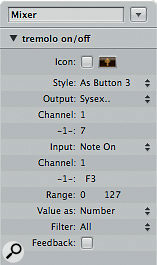 Click on the 'Bypass' button, go to the Inspector and set its Input to Note On, Channel to 1 and the -1- menu to C3. Next, select the 'Beat Repeat On' and then 'Beat Repeat 2 On' buttons, setting the Inspector as before. This time, set the -1- menu to D3 and E3 respectively. These settings will make the C3 key send the Bypass message, D3 send the first Beat Repeat message and E3 the third. Cable a monitor object from the second outlet of the Transformer object between the buttons and the Beat Repeat aux channel. This will be used to monitor incoming signals. 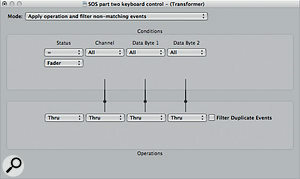 Click on the Transformer labelled 'Beat Repeat Input' and drag it onto the Arrange page. Logic will prompt you to 'Create New Tracks For Environment Object'. Click 'Create'. Record-enable this track to send the incoming MIDI data through the 'Beat Repeat Input' object. Press C3, then D3 and E3 on your keyboard. You should see that the buttons are now triggered and that your keyboard controls the effects in real time. If you watch the monitor objects, you will see that the note and fader commands appear in them. 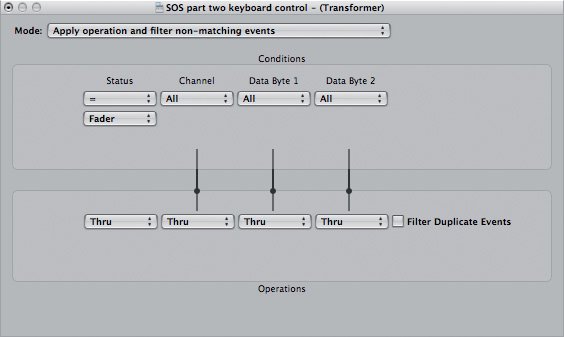 We don't really want the note messages getting through to the channel strip, so double-click on the Transformer object between the buttons and the aux channel, and in the Transformer window set the Mode to 'Apply operation and filter non-matching events'. Next set the Status to Fader. Now everything other than Fader commands will be filtered out. Set up the Transformer as shown to filter out everything but Fader commands. Now that we can control the Beat Repeat effect using a keyboard, let's take the concept further, to create a keyboard-controlled performance rig that includes other effects. Add a Tremolo to slot four, a Mod Delay to slot five and an Echo to slot six. On the Tremolo, set the Rate to 1/8 note, Depth to 100 percent and Smoothing to 3 percent. This will create an eighth-note chopping effect, which can be combined with the previous Beat Repeat ideas to further rhythmically mangle our audio. For the Mod Delay, load the Slow Flanger preset. This is great for adding movement to incoming audio. Finally, configure the Echo plug-in as follows: set Time to 1/16, Repeat to 2 percent, Colour to 37 and the Dry and Wet sliders to 67 percent. Engaging this plug-in will produce a sixteenth-note slap delay effect, which can be used to fill the holes created by the Tremolo effect. We're spicing up the keyboard-controlled performance rig by adding other effects. Set up the Tremolo and Echo as shown. We will use some spare keys on the MIDI keyboard to toggle our new effects-bypass buttons. First, though, let's look at some useful Fader messages. While watching the monitor object that is cabled to the outlet of the aux channel strip, go to the Tremolo plug-in and Option-click the plug-in to bypass it. The monitor object shows us that the settings F1, 59, 1 bypass the plug-in and F1, 59, 0 turn it back on. Following the method we've used previously, this would mean we would need one button to turn the plug-in on and another to turn it off. There is a more elegant solution. Using values of F1, 59, 64 will toggle the Tremolo's bypass button on and off, which is much more appropriate for what we are trying to accomplish. Create a new 'Button 3' object. Set its Output to SysEx, Input to Note On, Channel to 1, -1- to F3 and Range to 0 127. In the SysEx Fader window, paste in a Fader message from another button and edit it to read Fader Ch 1, Num 59, Val 64. Label the button 'Tremolo On/Off', cable the first available outlet from the 'Beat Repeat Input' object to its inlet and cable its outlet into the same Transformer object the other buttons are cabled to. Click on the button and you should see it toggle the bypass button of the Tremolo object. Now test the keyboard. You should find that F3 toggles the Tremolo plug-in on and off. The Inspector settings for the button object that toggles the bypass of the Tremolo plug-in on and off. 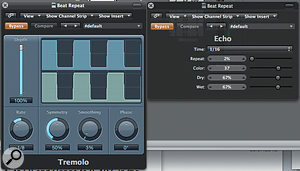 Option-click-drag the Tremolo button twice to create two identical copies. Edit the first one so that its -1- value is set to G3 and edit the message in its SysEx window so that it reads Fader Ch 1, Num 60, Val 64. Change its name to 'Mod Delay On/Off'. Edit the remaining button so that its -1- value is set to A3 and its SysEx message reads Fader Ch 1, Num 61, Val 64. Change its name to 'Echo On/Off'. You should now be able to trigger the bypass of the Mod delay and Echo from your keyboard. as disabling the Beat Repeat plug-ins. You should now find that pressing B3 on your keyboard or clicking the Three FX button turns on the three additional insert effects. Finally, we can look at recording movements into Logic's sequencer. Go to the Arrange page and record-enable the 'Beat Repeat Input' track that we created earlier. This track functions as a normal MIDI track, the only difference being that its output is the Beat Repeat Input transformer object in the Environment. Hit Record in the Transport Bar and use your MIDI keyboard to trigger different effects and Beat Repeat settings. Once you have recorded your movements, you can apply the usual editing tools to enhance your performance. Start by clicking on the region and going to the region's Parameter box. From the Quantise menu, choose 1/16 note to tighten your performance to the sequencer grid. You can also copy and loop the regions as normal, should you wish to repeat your effects choices. This is just the tip of the iceberg. Much more complex results can be achieved with only a little further thought. It's worth noting that if you're going to experiment further, you can take control of third party plug-ins in a similar way to Logic's in-built plug-ins.